One of the big advantages of homemade laundry detergent tabs is that each tab is a pre-measured amount of soap. It’s a simple and easy way to add just the right amount of soap to your washer. It also saves money because you’re not over adding additional soap to the washer.To make these tabs you naturally need some homemade laundry detergent. Jillee includes a link to her recipe. But if you have your own homemade laundry detergent, just use that. The process of making the detergent tabs is really simple. 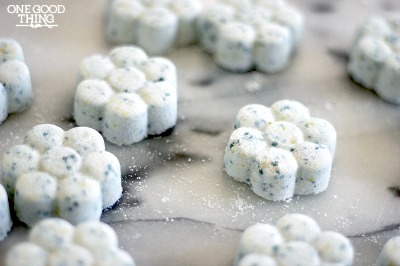 Click on the DIY Homemade Laundry Detergent Tabs Recipe link below to see the entire tutorial.